Disclaimer by Angie Hepp: Breastfeeding is always the best option for both mother and baby [if mother is herself well nourished according this recommend diet], and should be continued as long as possible unless medically contraindicated. When breastfeeding is not possible, the homemade formulas described in Nourishing Traditions and on the Weston A. Price Foundation website are the most nourishing alternatives available. When the reality finally sunk in that I was unable to breastfeed my baby for medical reasons, I was heartbroken. Thankfully, however, I was already aware of Nourishing Traditions and the homemade baby formula. Although I never thought I would have a use for it, I had read through the recipe and was familiar with the ingredients and where to purchase them. I began supplementing with the homemade formula when my daughter was 2 weeks old, and little Fiona thrived on it! She has always had such vibrant health that many people have asked me what I feed her. “What’s her ordinary day’s menu like?” they would ask. “Can you write down everything she eats?” While I most likely won’t be able to recall everything she’s eaten, I will do my best to give you an idea of what her diet has been like through her first year and a half. 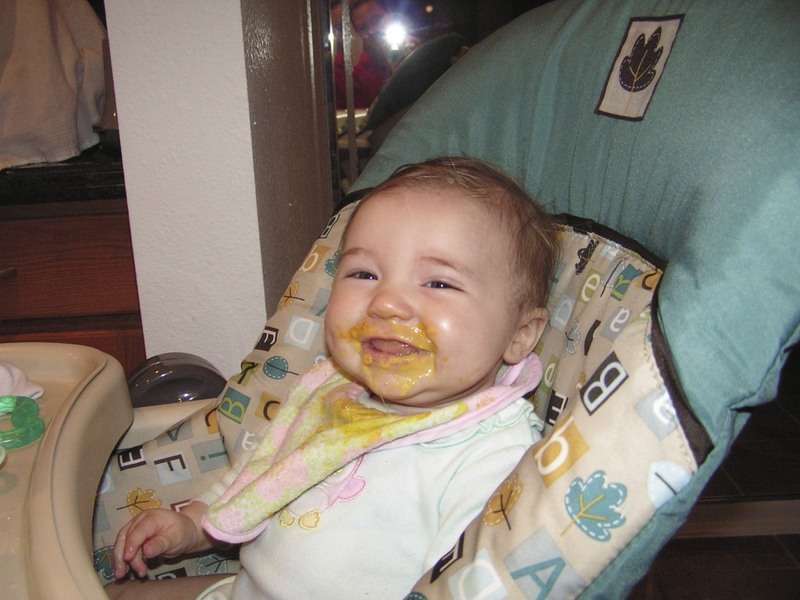 My daughter’s first food was lightly cooked pastured egg yolk from our own hens. I fed her the soft cooked yolk only, no white, with a drizzle of coconut oil and a sprinkle of Celtic sea salt or Real Salt. She was not too receptive at 4 months, so I tried again at 4.5 months. She still gagged a bit and spit most of it out at that point, but by 5 months she was ready and willing to eat. Besides her homemade formula, she ate only the egg yolk, coconut oil, and salt daily for a couple of months. Her daily fermented cod liver oil supplement was included in the formula. I gave her mashed banana a couple of times, but found that it constipated her, so I held off on that. Regarding grains: Isn’t rice cereal the best “first food”? “Babies have limited enzyme production, which is necessary for the digestion of foods. In fact, it takes up to 28 months, just around the time when molar teeth are fully developed, for the big-gun carbohydrate enzymes (namely amylase) to fully kick into gear. 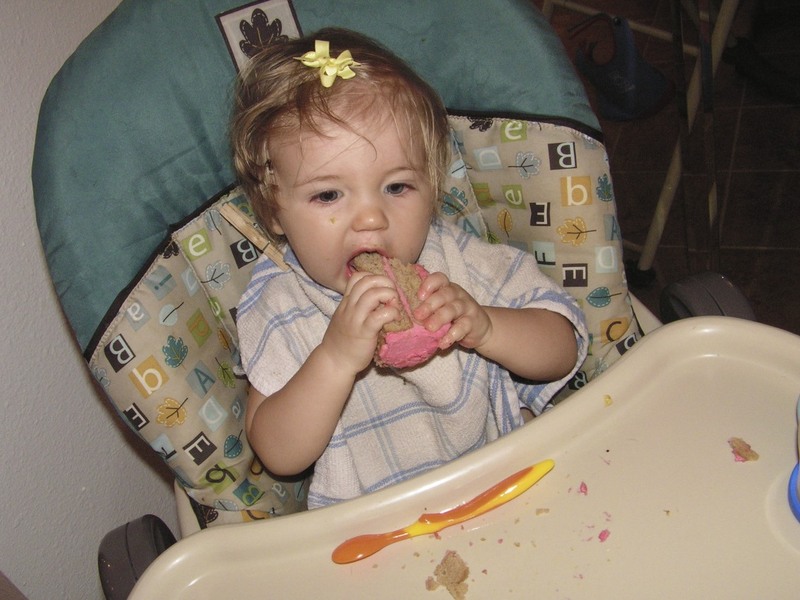 Foods like cereals, grains and breads are very challenging for little ones to digest. Thus, these foods should be some of the last to be introduced. (One carbohydrate enzyme a baby’s small intestine does produce is lactase, for the digestion of lactose in milk. )” – Sally Fallon in her book Nourishing Traditions. The next food I introduced in addition to the egg yolks, coconut oil, and salt, was raw liver. I know, it sounds gross, but actually, liver is a true superfood, one of the healthiest things we can eat. The myth about the liver being “the body’s filter where all the toxins are stored” is just that – a myth. Although the liver does indeed filter toxins from the body, it does not store them. It is not a septic tank full of old garbage. It simply removes the toxins from the blood and neutralizes them so they can then pass harmlessly out of the body by means of a very complicated 2-phase process known as Oxidation-Conjugation. Phase I converts the toxins to less harmful substances and Phase II makes the toxins water-soluble so that they may be safely excreted from the body (1). Didn’t mean to get off on a physiology lesson, but now you know the truth about liver! Very small amounts of raw veggies or fruits at this time, as they can be hard to digest. Still avoiding citrus and tomato at this time, as they are common allergens. Avocado was one of her favorite foods, and still is, although I have to limit it, as it tends to constipate her. All of the above foods, except with more lumps and less smooth consistency. I introduced some finger foods such as lightly cooked egg, avocado, occasionally banana, soft cooked fruits and veggies. I made a custard from egg yolks and raw cream, which she loved. One of her favorites was raw cheese – small pieces were her absolute favorite finger food. “CHEE! !” she would squeal excitedly, as soon as she saw me pull it from the frig. Quartered grapes were another stand-by travel snack. So far she has never tasted a Cheerio, Goldfish cracker, animal cracker, fruit snack, or juice box. At this time, cod liver oil can be increased to ½ tsp high-vitamin, or 1 tsp regular, per day. Photo above: Yep, those are chicken bones. They make great teethers! After Fiona turned one, I cautiously began to introduce some grains; only easily-digested grains such as rice and millet, and only after a long soaking in acidulated water in order to reduce phytic acid (read the whys and hows of soaking grains here.) I never offered them more than once a week at the most and always with plenty of good fats. They are still not a staple of her diet. They are probably more of a condiment! At this point, or really as soon as your baby can chew, you can begin to offer lacto-fermented veggies and fruits. An easy beginners recipe is sauerkraut. Lacto-fermented condiments provide loads of beneficial bacteria to colonize the gut and aid digestion, help ease constipation, and ward off illness. Fiona eats sauerkraut or another lacto-fermented condiment nearly every day. I just pile a ¼ cup or so on her tray and she grabs handfuls of it and stuffs it in her mouth. She loves it! Leafy greens, cooked with butter or oil. Collards, chard, kale, and spinach contain oxalic acid which is a goitrogen and is neutralized by cooking. They should not be given to babies under 1 year. Smoothies are one of her favorite treats. They’re a great way to pack in a lot of nutrients. Her smoothie typically contains: 2 raw egg yolks, raw goat milk, acerola powder, frozen organic fruit, avocado, cucumber, occasionally a bit of parsley, romaine lettuce, and a ½ tablespoon or so of coconut oil. Breakfast: Bottle of raw goat milk with ½ tsp high vitamin fermented cod liver oil and ½ tsp virgin coconut oil. Poached egg with ghee or coconut oil and sea salt. Leftover cooked veggies from last night’s dinner or a gluten-free mini-muffin made with chia or flax meal. Sauerkraut. Filtered water with a splash of kombucha. Lunch: Raw goat cheese; cut up grapes, pears, or other fruit; sweet potato with grated raw liver. Filtered water with a dash of sea salt. Late afternoon snack: She usually asks for another bottle of “mee-mee” (milk). Raw goat milk, but this time I do not add the oils, and I dilute the milk with a bit of warm filtered water. Dinner: Whatever Mommy and Daddy are eating. Since we eat gluten-free, we don’t need to worry about her consuming gluten. If we are having a dish that contains grains such as rice or pasta, she only gets a few bites of the grain, and eats mostly the meats and veggies. Typically beef, chicken, fish, or legumes, and roasted or raw veggies. She also eats whatever sauce happens to be on the menu, no matter how flavorful or spicy. She eats Japanese kimchi and Thai coconut curry with just as much relish as plain old applesauce. She eats no desserts. Period. No juice or refined or processed foods. That’s about it! I hope this has been helpful. There is a wealth of information at The Weston A. Price Foundation’s website, so definitely check out that resource. Much of what I implemented here I gleaned from the Weston A. Price Foundation, Nourishing Traditions by Sally Fallon, and from Nourishing a Growing Baby by Jen Allbritton, Certified Nutritionist. Thank you so much for this detailed testimonial, Angie! It is inspirational to me to read how our recommendations are implemented. I would also like to recommend the following books on the above healing protocols. They have a wealth of information, and you can buy these via our Amazon affiliation. Please share your experiences of nourishing your babies and toddlers in the comments below! Thanks you so much for allowing me to share my family’s story. It is an honor, and I hope it helps inspire others as well. I was wondering if you have older children, if so what does a typical lunch look like for them? It’s been a while since I wrote this article, so my oldest is almost 4 now. We don’t really have a “typical” lunch, as it really depends on what’s in season and what I have in the frig. Right now our garden is overflowing, so we’re doing a lot of veggies sauteed in butter, cream, onions, and garlic. She really likes kale or chard “chips.” I make them in the oven instead of the dehydrator so that the oxalates and goitrogens are reduced. She eats raw sugar snap peas, and we do a lot of green smoothies (without the high-oxalate veggies). I often serve leftovers from the night before for lunch the next day. This always includes some sort of meat (beef or chicken, usually). She snacks on raw cheese and I make nourishing “gummies” out of pureed fruits, veggies, and grass-fed gelatin. She and my 15-month-old LOVE those. A quick lunch when I don’t have leftovers is salmon & egg salad made with a quality brand of canned salmon and homemade mayo. I usually add lots of herbs and sometimes wild caught sardines. She drinks kefir a few times a week, and kombucha and homemade yogurt as well. Of course, she still takes her cod liver oil every single morning. If I don’t give it to her, she asks for it! I make grain-free or gluten-free muffins frequently, to have on hand for portable snacks. I use almond or coconut flour or sprouted rice flour. I use honey, and always try to decrease the amount of sweetener called for in the recipe. This time of year, we’re eating lots of zucchini bread! Oops, I meant “Thank” you, sorry! I just sliced my finger open, so typing is difficult! Ouch! I hope that heals quickly! Great job, and thanks for sharing! That’s very similar to the diet my 20 month old has been raised on. We do feed him more bread (‘toast’ as he calls it), but always of the soaked/sprouted grain variety. He’s never had refined sugar, never had juice, never had vegetable oil. His first favorite food was homemade kielbasa! We’re lucky enough to have a local organic dairy, and the three of us go through about 4 gallons of raw, whole milk a week. He loves his eggs in the morning, goes crazy over broccoli at dinner. For snack at school we give him raw, plain, whole-fat yogurt with a few frozen berries mixed in. It’s great hearing how other parents have had success with the same principles! Thank you! I have a four and half month old. It is encouraging to read these stories and get ideas. Our first two were fed the pediatrician recommended way. Did not know any better but I have learned a lot in the last 8 years! I would love to hear what you’ve learned and how your journey as evolved! Thanks for the great story! My 15 month old son is still breastfed, drinks the raw goat milk formula, and eats a similar diet as your baby. I still haven’t tried the raw liver…I cook chicken livers in lots of butter, garlic, onion, and some seasonings, and then make a pate. He only will eat it the next day when it’s cold. I am a bit concerned, as he doesn’t say any words yet…LOTS of babbling and noises, but no words that I can understand, anyway. He does understand what we’re telling him and he’s quickly learning colors and can point out different kinds of animals and characters in his books and even moos like a cow when asked. So many people think I’m crazy with the way I feed him. Everyone wants to know what kind of juice he likes, why he isn’t weaned yet, and why he doesn’t eat sweets. I just say I know when he’s not with me, who knows what he’ll get fed, but as long as I’m in control, he’ll get good nourshing foods. I appreciated hearing about your experiences, Rachel … I have heard parents report time and again that each baby is different, and that they do develop in their own time. Perhaps in the next month or two he’ll start to verbalized what he’s been taking in! Angie, I love that your offered this reassurance and your own experience to Rachel. It warms my heart to experience this level of community support! Bless you, ladies! Rachel. Our son has been eating this way and he didn’t start speaking till after his 2nd birthday. He uses complete sentences now at 27 months. Our doctor told us his son who went to John Hopkins Didn’t start speaking till he was 27 months – about the same time as our little guy. I spoke early and I have average intelligence, and I know of others who spoke late and have ended up at elite universities. I really wouldn’t worry about that as long as he’s eating the way he is!!!!! Alex, I agree. Pediatricians, well-meaning family and friends, the media, internet, magazines, etc, all want to put our child in a box, on a grid, or on a timeline. There are “phases,” “stages,” “milestones,” and more, all of which must be achieved at certain specific ages, and in just the right way. Ugh. As if us parents didn’t have enough to worry about! Thanks Angie!!! I’ll check it out : ). and THANK YOU SO MUCH!!! Angie for posting this and Sandrine for all of your efforts towards a healthy present and future for all! This is very inspiring! Yes you can! I can’t find my recipe though, but you can look around online and probably find one. I also recommend reading Super Nutrition for Babies. It’s a great resource…very in line with WAP and provides a full range of information + recipes for pregnancy, nursing moms, and kids 0-24 months. It is grain-free, casein-free, and refined-sugar-free. As far as I can remember, the only changes I made was that I used plain vanilla stevia instead of chocolate raspberry stevia. I colored it with beet juice, and did not change the recipe at all. It turned out fabulous, and we could all enjoy it! My son is 18 months old and has been the same way up until recently. His first real words were mama, and dada shortly after really young, but just recently he repeats everything with his first real “action” word being more lol. He talks alot but not really fully understandable or in sentences. But still. I’m interested in learning some recipes here. Don’t worry and compare baby to what others are saying- and I have to remember to take that advice also! My 16-month-old doesn’t use a lot of “real” words either. He’s starting to labeling more things (abut 5 or so) and babbles a lot. Sometimes he is “talking up a storm” but it’s in toddler-speak. :) I think that’s OK! His pediatrician said when kids talk like that they are definitely communicating, we just can’t understand them. I wouldn’t worry about it! You’re doing a great job! Thank you so much for this posting. My sister’s mother in law recently lent me NT to read, and I’m hooked, I can hardly put it down and seriously need to get my own copy. My son is 8 months old, hardly eating any solids yet and still breast fed. We have had lots of trouble with the “typical American approach” to his eating (gas, stomach pain and plain refusal to eat). When I read the section in NT about feeding him initially I was excited but skeptical, hard to break the old notions of soft cooked eggs, and other raw foods ( I’m young and definitely from the “over sugared” and overly sterile generation) and this testimony has me ready to re-start, the right way with him, so I thank you so much again for sharing! Yay for you! It’s never too late to start nourishing the next generation. Our own nutrition may not have been optimal, but we can start changing the health of subsequent generations right now. If the meat, milk, and eggs are from trusted, clean, organic or sustainable sources, then you should not need to worry about eating them raw. With the liver, if you freeze it for 14 days prior to grating/serving it, any bacteria should be neutralized. I keep a brick of frozen grass-fed liver in the freezer, and take it out and grate it frozen just before serving. I stir the grated liver into just about anything (it doesn’t even need to be warm) and serve right away. Sorry I snicker since I got kicked off of a baby formula for merely mentioning how this formula was a life saver for my baby who couldn’t have soy (we know now). The leader was very nasty about me questioning hypo-allergenic formula and all the processed corn syrup ect in it. She thought it should be a crime to give a baby raw milk. It is sad to think people really don’t think that real food – not something in a can is for our babies! Thanks for your post! Keep up the great work!! You are encouraging so many mothers to step out of the norm of the “typical American approach”. I understand about the rejection and criticism you received from your forum. I have received a few ignorant comments on my Youtube video tutorials for the homemade formula. Mostly people with the argument “cow’s milk is for cows.” And yet they are giving their baby GMO soy formula full of HFCS and processed everything. This is great to read! Although it makes me feel all kinds of inadequate, since my kids both got grains before their first birthdays, raw milk is impossible to get here and neither one has liked egg yolk or raw liver. My son is now 4 and does like a variety of healthy foods, but he’s exposed to loads of junk at grandparents’ and other people’s houses. His 16 month old sister is still getting breastmilk but is also a very picky eater, despite our best efforts. I really wish they would both eat more like what you described. Luckily, even so they’re both early talkers despite being bilingual. This is so impressive. I wish I knew these things 25 years ago as my children are grown. I would love to read me and get some menu ideas. We are eating healthy but my youngest son is not so inclined to want to eat what I fix him as he would rather have what everyone else is eating. way! Love to hear more. You may email if you can. Karen, you mention that your son “is not so inclined to want to eat what I fix him as he would rather have what everyone else is eating.” Well, here’s a possible solution to getting him to eat more healthfully…Just cook for everyone else the way you want him to eat, and then you will all benefit! Jenny has some excellent weekly menu plans on her blog http://www.nourishedkitchen.com. They provide me with some inspiration and a guided grocery list. 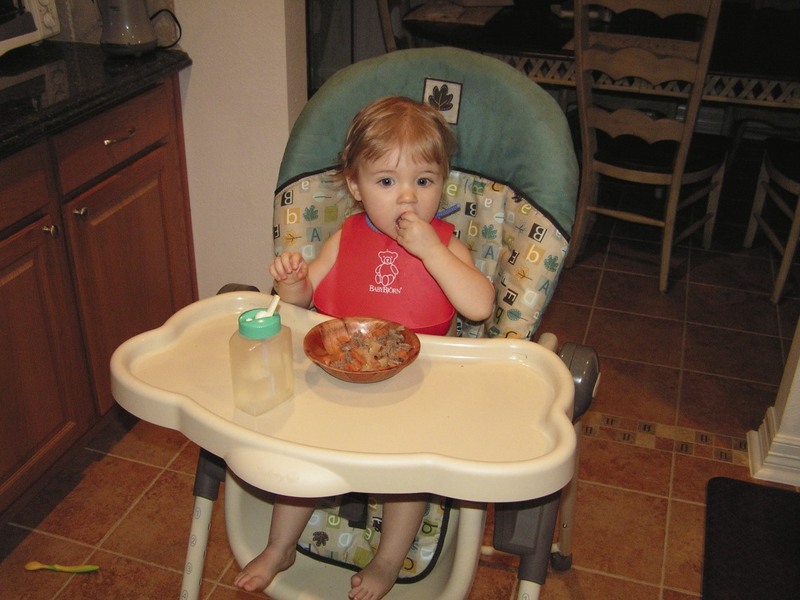 I wish I had known more about trational foods for weaning with my son. All I knew was the standard recommendations, baby-led weaning method, and just a few tiny traditional things like prechewing meat for babies and holding off on grains. I didn’t really know what to do, so sort of did a combo. My gut kept telling me the baby cereals were not the best, and I really just questioned everything I did. It was kind of stressful! Next time I’m doing it this way. Not sure where to start. I have a plan for the older kids to get them on a healthier diet. (5, 3 and 1(twin)). But, one of my twins (1) is special needs. We have had such a hard time to get her to eat and drink anything from the beginning. I found a local farm that has raw milk. I plan to go this week. Would cows milk or goat milk be better for a 20 month old? At this age would i still need to do the recipe for goats milk? Also she is on stage two baby food. What could I use to thicken her food. I am using rice cereal now. Goat milk is usually less allergenic than cow’s milk. It does have less folic acid than cow’s milk, but since your little one is 20 months already, I wouldn’t be too concerned about that. You can always puree some fresh beef liver and add that to her food to provide additional folic acid. I don’t think you need to do the full formula recipe, but I would do everything you I could to get a daily dose of fermented cod liver oil into her somehow. I mix my daughter’s with some full-fat yogurt, or applesauce, and she even eats it straight off the spoon (she is 16 months). I would also try to do the grated raw liver and egg yolk if at all possible. These are easy to mix with any soft food. Remember to always add a good splash of virgin coconut oil, olive oil, or ghee to each meal to provide adequate fat for brain development. As far as thickening her food – I would definitely avoid the rice cereal since it is devoid of nutrients and hyper-processed. You could try arrowroot powder (which is an unprocessed whole food) or mashed potatoes or cauliflower as thickeners. Bovine gelatin such as Bernard Jensen brand might work as a thickener for liquids (heat until gelatin is dissolved, then chill until thickened), or you could try ground flax seeds (which thicken to a gel when mixed with liquids). I wish I had had known a year ago what I know now; our newest baby would be eating so differently. However, we did know more at his birth than we did with our older two and you can see the difference in him! It’s amazing how diet plays such a large role in development. I was wondering about the yogurt, cheese and other dairy in the diet. I thought that babies shouldn’t have any dairy until a year old. I didn’t start feeding my daughter (unfortunately, it was rice cereal) until she was 7 months old. Why start so young, 4 months? Thanks, for the formula recipe. I had to supplement with formula when my daughter was a few months old because I wasn’t making enough milk for a few weeks, even though she was at my breast 24/7 and I was taking fenugreek and all the other supplements to produce milk. I love the blog and will definitely be using these recipes for my next baby. Thank you so much! Good question about the dairy. 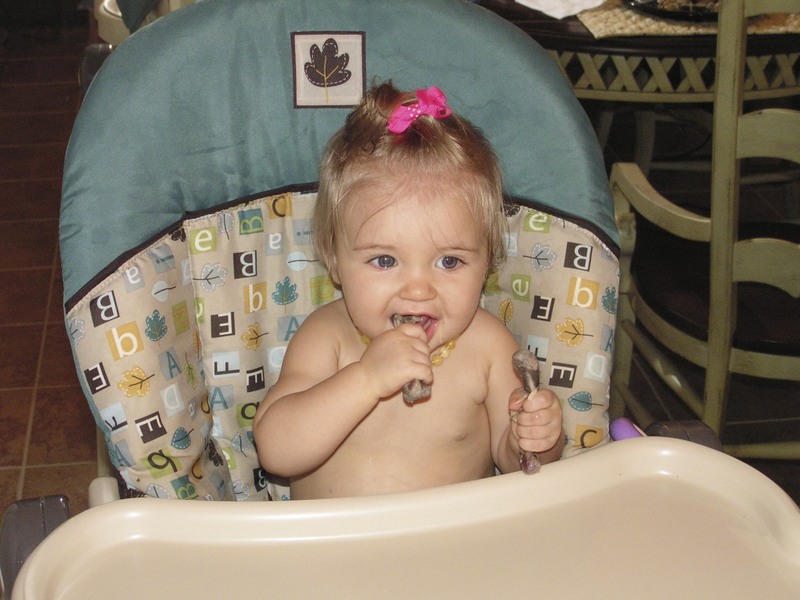 Fiona did not begin eating yogurt until she was about 7 months old, and cheese when she was about 10 months. The only foods she ate at 4 months were soft cooked egg yolk, coconut oil, and salt. The egg yolk provides brain-boosting vitamins and good fats, and is beneficial for all babies, breast-fed or formula-fed (unless an allergy is present, of course). My twin girls were born 12 weeks early (@ 28 weeks to the day). They weighed 1 lb 5 oz & 2 lb 6 oz at birth. They are now 15 months old and are developmentally on target (and ahead in some areas) and I swear I have watched their brains develop before my eyes. I follow a very similar diet with them as in the blog. Pastured egg yolks, liver, etc, grain free. I am 100% convinced they are doing so awesome because of their diet. Its really incredible to watch & witness your children’s brain develop before your eyes– amazing! I just found this site. I am a frustrated mommy who has a very ‘supportive’ family here in town. I have felt under their watch from the time we moved here. I was 8 months pregnant with my first. I had my own ideas of nutrition…I didn’t do any research but I knew that I wanted his diet to be sugar free and as healthy as possible (I was a little young and naiive though and really should have read up on some things). Anyways, my biggest example is how I would consistently ask that no juice be served to my children….it always was. We had a long list of circumstances as to why they played such a big influence in our lives but I won’t get into that. Bottom line is that I let my convictions go and my kids are horrible eaters. I don’t know a thing about nutrition and we’re all in a really bad place. I have 4 kids now and each time have been guilt ridden by my lack of knowledge. 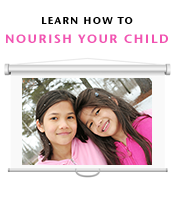 Do you have a place to start for kids who have already established poor eating habits? My kids’ ages are 6, 5, 3 and 16 months. Our little one is 4 months old today, so this is just what we’ve been talking about here & trying to figure out. My wife has just been reading Dr Mendelsohn’s book, which Angie mentions in the comments, but his nutritional advice for babies & toddlers is different. On pg 56-57, his recommendations are 1) Breastfed babies don’t need solid food before a year, but at least refrain until 6 months, 2) don’t give eggs or milk in the first year since they can cause allergies. He doesn’t say anything against cereal, but gives the OK to whole grain bread. Dan, good point, thanks for bringing that to my attention. I recommend the book because I approve of his very conservative approach to “well-baby” visits, and general pediatric health care. However, I do not agree with his nutritional advice, nor some of his advice on vaccines. Raw milk (let alone organic) is very hard to find here. i can get non-homogenised organic milk though. Would that be an ok substitute? Also, i have an egg intolerance so would it be best to hold off for my next child? I had no idea about these diets for my last two, but in the last year, went grain free, introduced the good fats and have good results for my ongoing health issues – so would love to start properly with my next. I also struggle to breast feed past 3-4 months so wondering what milk to use if raw is not available. I understand about the difficulty in obtaining raw milk. That is a tragedy, and is just another illustration of how we do not live in a free country. All that aside, there is a recipe for a goat milk-based formula, as well as a broth/meat based formula at http://www.westonaprice.org/childrens-health/recipes-for-homemade-baby-formula. As far as the egg intolerance – I can’t say for sure if you should avoid it or not. If it a true allergy, then it is probable that you passed the antibodies on to your daughter. However, it’s not guaranteed. I have a milk allergy (bummer, huh! ), so I have avoided giving my daughter dairy after I found out about my milk allergy. Allergy tests on young children are notoriously inaccurate, so what I would do (not that this is what I’m telling you to do, and someone please correct me if I’m wrong) is to avoid the suspected allergen until my child is old enough to have an accurate allergy test, and then I will know for sure if they can have it. Until then, I would offer as many foods as possible that contain the same nutrients found in egg yolks, such as biotin, folic acid, DHA, etc. Cod liver oil is essential, a good quality fermented cod liver oil such as Green Pastures brand. The other thing you could do (if you are OK with it) is to offer your child a tiny bit of egg yolk (as long as your egg intolerance is not an anaphylactic type reaction) and carefully observe for any negative symptoms. Things to watch for that might indicate a reaction would be change in bowel movements, perioral rash, increased irritability, etc. Loved this article! My daughter is 10 months old, and we are working hard to eat a real food diet. People laugh at me when I tell them that liver is one of her favorite foods. I was wondering what recipe you used for a first birthday cake. I haven’t introduced any grains yet, and I’d prefer to wait as long as possible since my family tends to have issues with them. However, if I can do a cake for her birthday, I would love that. Otherwise, I was thinking of doing a custard or some kind of fruit salad. Thanks for your input! Our liver is from the grass-fed beef cattle which we raised on our farm. But you can search on line for grass-fed beef liver and I’m sure you can find a place where you can mail order it. Or look for a local farm that raises grass-fed-only cattle (or sheep). The reason for freezing it for 14 days first is to kill any microbes or bacteria that might be on the liver from processing/packing. This is most important if you’re going to eat it raw, which is how it is recommended to be eaten. I have a 10 month old girl. I’ve been reading about Nourishing Traditions for a while. I got the book for my Kindle (unfortunately) and is really hard to read. I’ve been feeding her some of the good foods recommended on the book and a lot of the bad stuff (oatmeal, rice,quinoa, regular sweet potatoes, etc.) mostly soaked with whey and I add raw cow’s milk and raw or organic butter, and a touch of celtic sea salt. After reading this I’m choked! Can you tell me ways of cooking the meats? I’ve steamed chicken, but is to chewy. Thank you. I usually have a chicken or roast in the crockpot. The meat turns out super tender after cooking all day. It’s very easy for a toddler to chew, even with no molars. I usually just cut it into small pieces, or mix it with the fermented sweet potatoes or something similar. Also, you should be making stock regularly, so the meat that you use in the stock (even if it’s just bits of meat clinging to the bones) is very tender and easy for baby to eat. Also, whenever you make beef stock, after roasting the bones (marrow bones or oxtail), scoop the marrow out of the bones and feed directly to baby. Plain marrow straight from the bone one was one of Fiona’s favorite foods. I think this is excellent advice, Angie! I wonder if you might be willing to answer our Facebook reader’s questions once a week?! Thanks, Sandrine! I would be honored, however, I am really overloaded right now, with managing a growing food co-op, running my home business (angelasamber.etsy.com), caring for my toddler, homesteading, and now struggling with severe sickness and fatigue due to another rough pregnancy. When I get to feeling better, and if things ever slow down around here, I will certainly chime in on the FB page. (-; Thanks so much for the invite, though, I am honored! can you tell me your opinion on fruit fermented drinks for kids? do you have to use whey and salt in them? Do you need them to reduce the alcohol content? Also when cooking the egg for a 6 month old should the yolk be dry like hard boiled egg or come out soft liquidy like an over easy egg? You want the yolk to be warm and runny. It’s easier for them to eat that way, plus it has more of the nutrients intact. We do not drink any juice at all in our house, so I couldn’t say about fermented fruit drinks. I would definitely not recommend plain fruit juice. My daughter occasionally drinks small amounts of home-brewed kombucha mixed with water. Angie, what about coconut water kefir? i have never tried but i read about the benefits on nourishing our children’s FB page. Wow, this post and the comments are inspiring and full of info+ideas. Thank you. My daughter is nearly 3 1/2 and has had a lot of infant caries. She had zero interest in any food — only breastmilk — til 14 months and even then, she’d have so little and nursed mostly. Her diet consists of daily FCLO + butter supplement, raw homemade cow’s milk yogurt and kefir and butter, our hen’s fresh eggs (when she’s in the mood — come 3 yrs, they go back and forth with what they will eat!) and she won’t eat soft boiled eggs, only lightly cooked), soaked+fermented oats/porridge with raw butter or ghee, soaked&crisped nut butters, garden veggies, soaked basmati rice or quinoa, some noodles and breads (mostly sprouted). I make saurkraut but she doesn’t like it. She is very adventurous and will try most everything (was just at a fermenting workshop with Sandor Katz and she tried EVERYthing! ), but she doesn’t always like it. Texture is a ‘thing’ and she doesn’t like ‘lemon’ flavor. My husband and I had been vegetarians for 13 yrs and are really trying to eat more salmon and poultry, but our daughter won’t eat it much. We don’t eat cow by personal+spiritual choice. I want to get into chicken bone broths (i might have access to elk bones, thoughts?) and ANYthing else that might help her teeth, as it is crazy stressful and emotional to feel helpless…like I’m failing her. I’m needing suggestions and baby steps with ideas. I do have the NT cookbook, if you refer to anything there. Also, a side note, she has a severe food allergy to tomatoes, strawberries, and cantalope (so far, we know) — she will vomit for 12 hours afterward. Also, she had a traumatic birth and had a lot of antibiotics her first week of life. She has had 6 cavities and has 3 more. She has never had refined sugar or juice. Only fresh fruit and since 2-2/12, she’s had honey and maple syrup. I’d appreciate any helpful + encouraging words! Thanks Angie and everyone. If you read Ramiel Nagel’s book Cure Tooth Decay his daughter also had caries. He had to completely eliminate FRUIT – no maple syrup, no honey. Any fructose, sucrose would make her teeth worse. Also, he doesn’t recommend grains or beans because of their phytic acid, particularly at this stage. The phytic acid is an anti-nutrient and she needs all the nutrients she can get. Phytic acid is good for people who are too high in iron, for instance. She’s better off with starches that don’t have phytic acid like squash, heirloom potatoes, beets, carrots – even white rice. We do a rotation diet with my son and every fourth day he can have white rice with a ton of ghee. One day we’ll do peas, the other carrot soup, the other squash, the other potato, for instance. Also, make sure your daughter’s vitamin d levels are good. hi Alex, thanks for your immediate response! i have Ramiel Nagel’s book but i am going to read it again as i read it over a year ago and a lot didn’t make sense and was strange. she doesn’t eat so much fruit, especially with her severe allergy to the few i mentioned, but i will eliminate now along with the occasional honey and little maple. as for the grains and phytic acid, i soak and ferment our oats, brown rice and quinoa which neutralizes the phytic acid and provides beneficial bacteria and is much more digestible. i’ve been doing this for the past 8 months. (wish i would have learned it sooner!) and yes, we load up these with ghee, too! i like the idea of the rotation with veggies — and she loves peas, carrots and squashes. oh! and she gets tons of sun (we live in NM) AND daily fermented cod liver & butter oil, which contain vit d. Do you know if there a test to know if her levels are good — if she’s absorbing it? ramiel said if his daughter ate ANY fruit it was too much ; she would immediately start to complain of tooth sensitivity. grains are really tricky, particularly is one is sensitive. i believe ramiel completely cut them out in order to heal his daughter’s caries, and i know that he knows about soaking and fermenting grains because he’s familiar with weston price. It might be worth cutting out grains just in the beginning until she heals her teeth. you can order a vitamin d test through life extension.org. I don’t think it would hurt to have her tested. It looks like the grains were even more of an issue than the fruit! sorry jenny. i meant to say that he completely cut out all sweeteners – even those considered whole and natural. When is it OK to introduce soaked quinoa? I haven’t run across much information about it. Thanks! Hi NiIkki – we recommend to wait at least one year to introduce any and all grains. I would personally recommend that one wait until 2 years. No rush – grains are not the most nutrient dense foods and not at all recommended for a developing baby until much later. Thank you for your quick reply! My son will turn 1 at the end of this month. We’ve held off on all grains so far, although I did make some soaked quinoa this week for him to try out (mostly because I felt like I was running out of ideas for what to feed him/pressure from my mom :). I think I’ll go back to waiting and look up some creative recipes for the foods I know are good for him right now. One more question. Now the “hot” advice from pediatricians is that it doesn’t matter about delaying introduction to highly allergenic foods, like peanut butter, etc. Have you ever seen this delaying of foods “backfire” (for example, holding off on nuts or grains and then having an allergy problem down the road)? Or, can it only be beneficial? I have a son and I notice he is very happy and smart! I give him raw egg yolks and goat yogurt from an organic source (I eat the same way!). But I also eat raw salmon from time to time, do you think this will be good for my son aswell? Certainly, as long as it is from a clean, reputable source that you trust. If you have any concerns, you may freeze it for 14 days first, then thaw and mince, then mix in with the egg yolk and some sea salt. Salmon roe is another great superfood for babies. My baby boy is now 10 months old. I really wanted to introduce egg yolk in his diet for all the benefits. But he has been tested for allergies and we found that he’s very allergic to egg white and mildly allergic to egg yolk. What else can we give him to substitute all the nutrition we could have got from an egg yolk? Thanks for your help. You might try duck egg (yolks only). Some people who are allergic to chicken eggs are OK with duck. Also, allergy tests performed on babies and toddlers are notoriously inaccurate, so I don’t know that I would go by that, but rather observe carefully for reactions to certain foods. You know him better than anyone, and should be able to recognize if he is having a reaction. The most common reaction is perioral erythema (redness around the mouth) after eating the suspected food. Definitely only the yolks, though, not the whites. If you want to stay away from eggs altogether, definitely give him raw grass-fed beef liver, raw yogurt or kefir, fermented sweet potatoes, etc. all served with plenty of olive and coconut oil and sea salt. This sounds so great, I just can’t seem to get over the fear of eating raw egg yolks myself… let alone give them to my daughter. The world has made me paranoid about salmonella poisoning! You know – every menu you read gives you the warning! How do I get past that?? You can try a soft boiled egg yoke because it would still retain a lot of the enzymes. That’s what I did with my son starting around 6 months. I totally understand how you feel! I had to get over the same hump when I started giving him raw cheese. I just make sure it’s from a good source. I’m so happy that I found this blog. My son is 5 and a half months old and I’ve been trying to figure out how I want to start feeding him. I came across the suggestion of raw egg yolk.. Or runny soft boiled egg yolk. First I tried soft boiled runny yolk and he got very sick. His skin got very red and patchy and then that night he threw up. I thought maybe I had given him too much (one whole yoke) because I read that it can be very rich and filling. The next time I cooked the yoke completely and gave him just a quarter. This he did just fine. No rash, no sickness. Today I once again tried soft boiled, hoping that he had worked up to being able to eat it. He did great but got just a little red around the mouth and one patch on his forehead. Is this from any possible egg white that may be making its way into the yoke when I get it out? I noticed that I don’t get the entire egg yolk when I soft boil it and have tried to scrape some of it out. I would really like to continue feeding him the soft cooked yoke because of the benefits but don’t want to be harming my son if he does, in fact have a yoke allergy. I do not and neither do any of my family members. advice would be greatly appreciated! Thank you for this wonderful article. How I wish I had known these things earlier! I am writing in hopes that you might offer us a little wisdom. My sweet little boy, now a little over a year old, was diagnosed at his one year appointment as being moderately to severely iron deficient. My husband and I were devastated to see how little he had been getting of what he needed. A little background on us– we have generally been long time vegans– probably 15 years or so, though I did eat some meat and dairy during pregnancy. I am passionate about cooking and I thought we always ate well– very little in the way of processed foods, lots of great smoothies filled with greens and soaked nuts and all kinds of good things, etc. And we always took the necessary supplements recommended by books on vegan nutrition. However, while our diet appeared to be mostly sufficient for our needs, our son never ate anything in the quantities he would have needed to get what he needed. Looking back, I suspect that as the anemia progressed, with us not yet knowing what was going on, his appetite became increasingly diminished. Meanwhile, he continued to nurse like a champ, and this was very important for us, especially since my son had been born with an issue that required him to have to major surgeries in his first year. It has been a very challenging year for us, and nursing has been a huge part of how we’ve coped. At times when nothing else could help, nursing has provided the comfort and spiritual nourishment that both of us needed to face the challenges that we were facing. Now, with the benefit of hindsight, I am heartbroken to think of what my son has had to endure while in an actual state of being malnourished! So over the last few weeks, my paradigm has shifted completely. After fifteen or so years of cooking only plant based foods, I am trying to educate myself to base our family’s diet on these traditional foods. And honestly, I’m feeling a bit overwhelmed. I started with stews and bone broth, which has been good. And I have been trying to get him to eat egg yolk in various forms, which he’s not terribly interested in. I guess I could distill my yearning for guidance into three main questions. 1) What kind of balance do you strike between different forms of meat? For example, how much beef might one consume in a week as opposed to seafood, chicken, etc? 2) What iron superfoods would you recommend for a one year old? Especially helpful would be fingerfoods that can be put out for him in a tray, or fed to him little by little throughout the day. He really is not into consuming much at a given meal, but if I follow him around feeding him a spoonful of this, a fingerful of that, all day long, I can get some food into him. So I need things that can be offered in this way. 3) Paté sounds like an important possible ally. Unfortunately, my son only eats the tiniest bites of things initially. Can it be frozen so as to be doled out in only small quantites? Thank you so much, Sandrine, for providing this forum for me to share. And thank you also for your beautiful, loving example. Any thoughts you (or fellow readers!) may have, I would be so grateful to hear. Dr. Price studied many traditional civilizations, and although they had in common the fact that NOT ONE of them ate a strictly plant-based diet, they were all different as far as what meats they did consume. Some ate only fish and whale blubber. Some ate only goat meat and milk. Etc, etc. We have the unique privilege today of being able to obtain all types of meat and seafood. Another thing those civilizations had in common was that organ meats played a significant part in all their diets. I would say that whatever meats you can get your family to eat are certainly better than none. Red meats are going to be higher in iron, especially red organ meats. Pate is an excellent option and yes, it can be frozen! Is he taking Green Pastures fermented cod liver oil and butter oil? This is one of the most nutrient-dense superfoods and is a great way to shore up a deficient diet. I would highly recommend starting him on that. Continue to try to get in as many pastured egg yolks as possible. Now that he is over a year, he can have the whites, too, so an easy finger food is scrambled eggs or omelette cut into bite-size pieces. Remember that animal fats and proteins should be comprising the majority of his diet at this point. Vegetables and fruits are not absolutely necessary. Do you have access to pastured pork lard and/or grass-fed beef tallow? These are also very nourishing. It is available from US Wellness Meats if you can’t find it in your area. Raw milk, cream, and butter are good, too, check realmilk.com for listings in your area. I’m sure I’m forgetting something, but perhaps Sandrine can fill in any gaps. Oh, I forgot to mention– he’s also on iron supplements right now, prescribed by our doctor. But I would like to get our diet to where, once he is no longer anemic, and his iron stores are back up, artificial supplements of any kind may not even be necessary. Hi Noe. I had a very similar issue with my son. I was vegan/ vegetarian before conceiving and started WAPF during my pregnancy. He was born IUGR, and discovered he was severely anemic at 1 year. Like you, we had to supplement and we used a chelated iron supplement FERROCHEL by Designs for Health. His iron was optimal in one month. it would have taken at least three with the iron sulfate and caused more gut issues. We then stopped supplementing. We do mostly grassfed meats, pastured eggs, not much chicken, not many grains, not too much fruit. Please feel free to email me agatsis723@gmail.com. And yes, Noe we stopped supplementing immediately once his levels were optimal and with a WAPF diet, he has not had to supplement nor will he ever have to…. Where do you get fermented cod liver oil? http://www.radiantlifecatalog.com or http://www.azurestandard.com. I believe there are a few other places to get it, too, but we get it from Azure, since their prices are the best and they have a drop in our area. Thanks for sharing guys! I have a 9 mo old who is in good health. I have been either veg, vegan or raw for the last 13 yrs. I always thought that raising a vegan baby would be my course. However, when I got pregnant I was crazy sick. It really got me wondering about my diet and led me to WAP. I’ve had ‘Nutrition and Physical Degeneration’ on the book shelf for years and have never read it. So I’m reading it now. I’ve ordered ‘Nourishing Traditions’. If either of you would be interested in keeping in touch, I’d love to glean from your experience. I’m still working on the mental leap of eating meat again. Hi Mary, Yes, I’d be interested in keeping in touch. My email is agatsis723@gmail.com. Sometimes using specific supplements can be helpful in the transition. I can email you both more info. We took custody of a two month old who had a previous diagnosis of GURDS. In my efforts to help this LO, I recruited the help of a friend. Together we discovered homemade formula and this baby is thriving! No more GURDS! He just turned 7 mths, weighs 20.5 lbs and has a bright and beautiful disposition. We tried egg yolk at four months but it wasn’t well received. At 4 1/2 months it was better. Steadily, yolks have become a favorite, along with liver, avocados, banana, carrot, and chicken broth. LO sleeps through the night and is often commented on a the happiest baby ever seen! Wonderful! It’s so exciting to see how we can change a life for the better through real, nourishing food. And lots of love, of course! Help I am concerned. I am trying my best to keep my 15 month old on a Weston Price diet and I am still breast feeding her once in morning and at night. I am a novice with this diet and have been trying my best to follow Fallon’s book. I give her whole pasteurized milk during the day (I can not find raw milk near me.) her typical day she gets raw egg yolk, scrambled egg, cod liver oil, half banana and half avocado for breakfast. Lunch she eats organic chicken or fresh fish earths best apple sauce or sweet potato. Snack – baby yogurt. Dinner same as lunch. She has never had firm stools and I always thought it was from the breast milk but now I am concerned I am doing something wrong. Her 15 month old check up was today and the doctor told me to give her white rice to help with the loose stools. I know white rice is not promoted by Weston price diet. What do you think I am doing wrong? What can I give her to help harden her stools? Should I be concerned? She usually goes two to three times a day sometimes the stools burn. Did this happen at all with your daughter? First of all, congratulations for doing all that you are already! Three times a day is not abnormal, my 17 month old goes three times a day nearly every day. His stools are very soft, not runny/liquidy, but definitely not “formed.” As far as the stools burning, that could be from acidic foods such as oranges or tomatoes. So I wouldn’t worry about trying to firm up her stools or make her go less often. As long as she is not having diarrhea and getting dehydrated, of course. In my opinion, I would stop giving her the pasteurized milk. If you can’t find raw milk, she is better off without any milk at all. You can give her bone broth instead. My little ones both drink bone broth with a little sea salt added. Also, you could consider nursing her one or two more times a day, if possible. Many breastfed babies are still nursing several times a day at your daughter’s age. If you really want to continue giving her the pasteurized milk, I would at least culture it first with kefir or piima. Check the label of the baby yogurt, too. Many baby yogurts contain added sugars (or worse, artificial sweeteners), artificial flavors, dyes, and are of course made with pasteurized (dead) milk. Angie, thank you so much for taking the time to address my concern. It is so helpful to have someone else’s insight who also believes in feeding their child the best nutrition. This is my first baby and I have been doing all this nutrition stuff on my own so far. The two books nourishing traditions and super nutrition for babies have been my bibles. I have been trying my hardest to follow some of the recipes, but it is very hard when every one around you and also the society you live in does not practice this diet. Back to my concern about her stools I would not say she has diarrhea. They are formed as you mentioned, but messy. She is definitely not dehydrated and she is thriving health wise. My pediatrician just seemed so concerned that I said they were always loose and that is why I started panicking. I am going to follow your advice and go with my gut and stop giving her the whole pasteurized milk. My pediatrician had told me she needs to have it to help her brain develop so of course I gave in to society when she turned 1. My daughter hates whole milk! I truly believe she knows what is best for her and that she has been trying to tell me these last few months that hey this stuff is not good for me. I will start feeding her bone broth and filtered water and also nurse one extra time in mid day. I am going to try to take a trip to a health store and purchase some better yogurt. I just made your sourkroute recipe I will let you know in three days if it was a success. I think the sourkraut was a success. I just tasted a little and it does taste like sourkrAut, but how do I know it turned out right? I did have an issue with the lid leaking or perspiring I used a cleaned out pickle jar and had to put it inside a bowl because of the leaking. Little Bubbles were forming under the ziplock bag and I am pretty positive it was oxygen free under the bag. Thanks. When did you start weaning her from the formula? My 10.5 month old son is breast fed and eats only WAPF approved foods, although I didn’t realize there was a good menu until I read it today, so I’m going to start that soon, however, I know my milk isn’t as nutrient-dense as it should be and for medical reasons I fear I will have to wean him as soon as possible. Should I make the formula for him or just give him raw cow’s milk with the recommended daily “menu” from WAPF? He is primarily a booby baby and really doesn’t eat very many foods, but his teeth are crumbling despite taking FCLO and I think maybe my lack of quality milk has something to do with it. Thank you in advance! I believe the answer which the WAPF would recommend is to stop feeding the formula whenever you would typically stop breastfeeding, so in other words, the longer the better. If you would normally wean around 2-3 years, then the formula would still be beneficial up to those ages. Obviously, if they are eating ample amounts of nutrient-dense foods, it’s not as critical to continue the formula, but if they are a picky eater, or if they are only eating small amounts I would definitely continue the formula. The formula is more nutritious than plain cow’s milk, so I would offer the formula as long as possible. Hi! What brand of cod liver oil do you recommend to start babies on? Double Duty: Breastfeeding While Pregnant?